My brother Grant is a big fan of Spoons so when he suggested a cheap and cheerful pie n pint I thought I’d oblige by suggesting the White Lady. This is a Spoons at the heart of Corstorphine, on St John’s Road, and not too far from Grant’s abode. 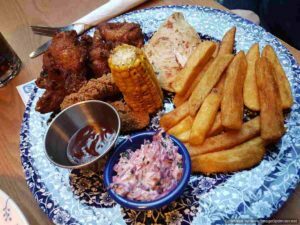 Corstorphine has a thriving local bar and restaurant scene in the west of the city, with the likes of Wong’s, Spice Lounge Kitchen and Fabio’s to be found busy throughout the week. 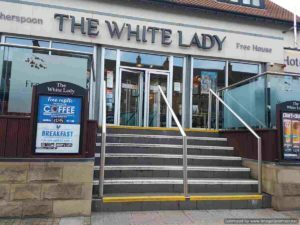 We found the White Lady similarly well-stocked with punters. I had a swift half at the bar and waited for Grant to arrive before we took a seat at a table in the rearmost section of their extensive dining space. From there we took advantage of the Spoons app from which you can order food and drinks from your phone. This seemed to work pretty effectively throughout. Things promptly arrived looking much as expected. The chips were of the well-cooked oven variety; solidly decent but nothing too spectacular. Grant was pleased with his chicken selection which was plentiful. The wings looked pretty good. My pizza was liberally topped with mozzarella so consequently quite satisfying. 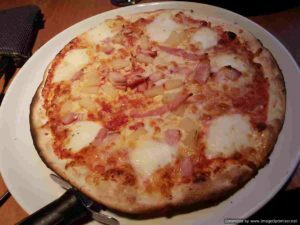 The base was light and crisp, and the Wiltshire cured ham plentiful. I enjoyed it. So overall, the White Lady offered up the usual cheap and cheerful Spoons delights, but struck me as one of the better ones I’ve sampled of late. Give it a look next time you fancy a low-cost pint or no-frills snack.